Smile Cliniq is proud to announce that we have won the Best Practice in London award at the Dentistry Awards. 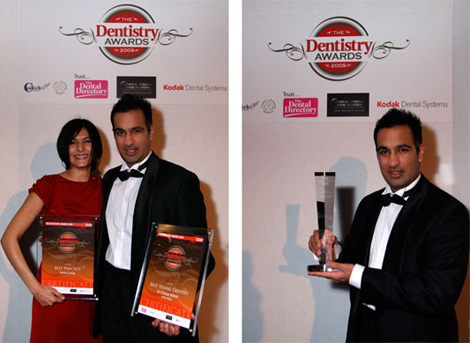 Dr Kaher has also been awarded the Best Young Dentist London and also Best Young Dentist UK. We are pleased to be rewarded for the effort and hard work we’ve put in to becoming a successful practice, where we provide our patients with the highest quality of treatment and advice. Smile Cliniq would like to thank all our patients for their continued support and loyalty. Here at Smile Cliniq we are proud to announce that our practice we have won several awards recently, including the Best Practice in London at the Dentistry Awards. We refuse to rest on our laurels however, and will continue to strive to be the best private practice dentist in the city. If you’re looking for the best dentist London has to offer, look no further. We provide a full range of dental treatment including general, cosmetic, implant dentistry as well as facial aesthetic treatment. At Smile Cliniq we put all of our patients at the heart of everything we do, helping them to achieve and maintain a healthy mouth. We provide all of our patients with the highest quality of treatment and a full consultation on their first visit so our patients can make an informed decision on the most appropriate treatment for them. We offer all of our patients cutting edge dental treatment using the latest industry technologies. To help make our dentistry as transparent as possible, we also provide a full treatment plan with all written costs included before we begin any of our treatments. Smile Cliniq is officially an award winning London dentist, having received several very prestigious awards within the world of dentistry. We are incredibly honoured by our awards which include the Best London Dental Practice, Best Young Dentist London and Best Young Dentist UK. Here at the Smile Cliniq we take great pride in being recognised for the effort and constant hard work we put into achieving the results that we are known for. Smile Cliniq strives to remain the best dentist London, with an ethos centred on creating a friendly atmosphere for our patients. At Smile Cliniq we work hard to ensure that all of our patients are offered the best dentist treatments possible. If you would like to book an appointment at one of the best dentist London or for any other enquiries please do not hesitate to contact a member of our team. We currently have two best dentist London practices. For our Finchley Dentist Practice contact us on 020 8090 9077; for St Johns Wood please call us on 020 7328 1200.